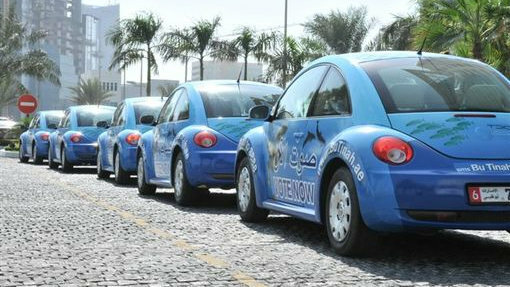 Abu Dhabi’s Environment Agency EAD has just recently released a fleet of Beetle cars, which – on their way all through Abu Dhabi – are helping to raise peoples` awareness for the VOTE BU TINAH! campaign, as well as to boost their enthusiasm for voting via SMS for Bu Tinah Island as one of the New7Wonders of Nature. The flashy little cars are going to tour around Abu Dhabi for the entire month of November.